August 3, 2018, Leh, Ladakh, J&K, India – This morning, on the final day of engagements during his current visit to Ladakh, His Holiness the Dalai Lama drove up to the section of Leh behind the old palace. He had been invited by the Anjuman Moin-ul-Islam to inaugurate a public park they have created at Juma Bagh. Groups of people stood at the side of the road all along the route to greet him. On arrival at Juma Bagh he was welcomed by Dr Abdul Quayum who requested him to unveil a commemorative plaque symbolic of inaugurating the park. Once His Holiness and other guests were seated, Dr Quayum greeted them, saying, “As-salamu alaykum, Tashi Delek, Juleh and welcome”. He explained that while they could have built a hotel or business centre on the site, Anjuman Moin-ul-Islam decided instead to create a park where families could relax together: a place of greater public value. The park includes several places to eat, a gym and an archery centre. Future plans include displays from every part of Ladakh. Dr Quayum drew His Holiness’s attention to a shop set up by a Mr Iqbal, who, handicapped himself, has created employment for other handicapped people making goods from recycled materials. Refreshments were served. His Holiness was asked to present katas to people who had contributed to the setting up of the park. First to come forward was Mr Iqbal, carried on a friend’s back. Saluting His Holiness on behalf of the community, Dr Quayum then requested him to address the gathering. “Dear brothers and sisters,” he responded, “I am indeed happy and honoured to have come here to meet you and see what you have done. I’m particularly impressed by the opportunities created for handicapped people. I am frequently asked to bless handicapped children and adults and I feel sad that there is so little I can really do to help them. Of course, I can say mantras and blow on them, but that is one of the times when I wish I really had the miraculous power that some people attribute to me. “I am reminded of visits I made to Baba Amte’s ashram. He gathered a community of people who had suffered leprosy that had left many of them handicapped. And yet I was hugely impressed by their confidence and good spirits, which I’m sure were the direct result of their having been shown compassion and encouragement. His Holiness told the crowd he didn’t have much more to say. He mentioned that he will leave tomorrow for Delhi and in a few days will travel to Goa and Bangalore where he will talk to young Indians about the benefits of learning about ancient Indian understanding of the workings of the mind and emotions. “Nobody wants suffering, but we bring problems upon ourselves because we give in to our negative emotions. The real source of trouble is not any weapons we may possess, but the anger, hatred and jealousy in our hearts. On the one hand I believe that if we want to live in a more peaceful world we need to demilitarize it. In fact, at a meeting of Nobel Peace Laureates in Rome a few years ago, we seriously discussed plans to lay out a timetable for the elimination of nuclear weapons. Driving back from Juma Bagh to Shewatsel, His Holiness stopped briefly to consecrate a new chörten constructed at the Leh, Saboo and Choglamsar junction by the medium of the Dorje Yamakyong oracle. 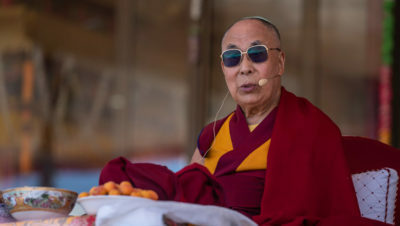 Arriving at the teaching pavilion on the Kalachakra Ground at Shewatsel, His Holiness blessed several groups of elderly people who were waiting for him. He greeted the crowd sitting under canopies on three sides of a square and took his seat on the stage. Several cultural events, songs and dances, took place on the tarpaulin covered ground. President of the Ladakh Gonpa Association Geshe Shedrup Jhampa gave a welcoming speech. He noted that over the years His Holiness has visited almost all of Ladakh and has given the Kalachakra Empowerment in Ladakh three times. He added that His Holiness has given so much in terms of education and advice that he has, in effect, given the essence of the Kangyur and Tengyur. He concluded with a prayer that he come again next year. Responding to a request that he say a few words, His Holiness began by thanking his friends in the LBA and LGA for organizing a celebratory lunch. “I reached here on 3rd July and today’s 3rd August, so it’s been a month,” he continued. “During this time I’ve been in Leh, Nubra, Zanskar, Kargil and Mulbekh. The devotion and faith of the public have been unwavering. And since I’ve been able to give some teachings, I feel I’ve been able to make a small contribution to the Dharma and the welfare of beings. “In all the places I’ve been, our Muslim friends joined us which I appreciate. I think we’ve been able to bring the two communities a little closer together. “The Drikung Monastery at Kema Kyongru has invited me to visit next year, but we’ll have to see if I’m able to go. When it’s raining and humid in Dharamsala it’s good to come up to drier Ladakh. But, this old man is coming to Ladakh to rest, not to follow a hectic program. Whether I’ll go to Nubra or not, we’ll have to see. Next year I’ll be 84. Would you prefer this old fellow to take things a little easier and live longer, or follow a hectic schedule and have a shorter life? You here and the people in Tibet all pray that I live long, but my body is only flesh and bone and if I tire it out it’s likely that it will shorten my life. LBA Vice President, PT Kunzang thanked His Holiness for passing his summer sojourn in Ladakh once more and invited him to come again next year. He thanked everyone who has contributed to making His Holiness’s visit a success including the LAHDC, the DC, the SSP and so forth. His Holiness was joined for lunch in the teaching pavilion by Ganden Trisur Rinpoche, Thiksey Rinpoche, Thuksey Rinpoche, Woeser Rinpoche, and other lamas and officials of the LBA and LGA. When it was over, he drove back to the Shewatsel Phodrang. Tomorrow morning, he will fly to Delhi.